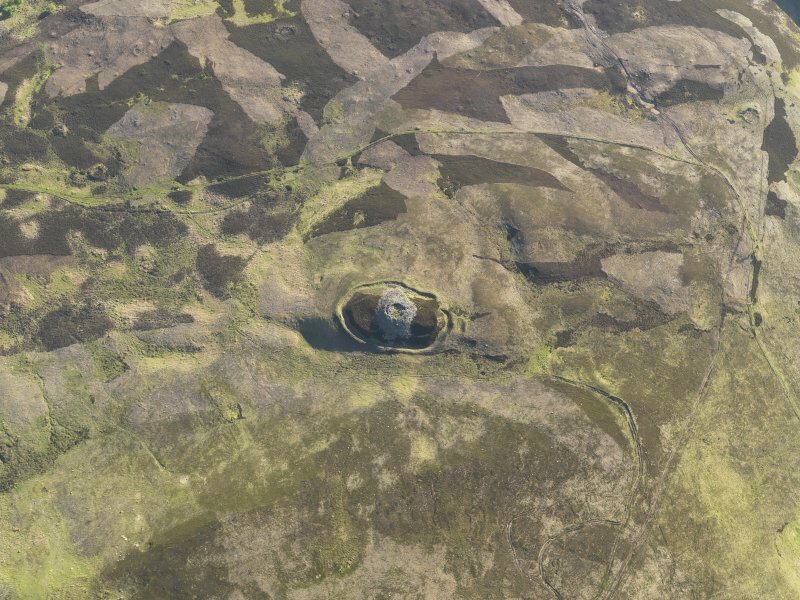 Oblique aerial view centred on Kilphedir Broch with the small cairns and hut-circles adjacent, taken from the SSE. Oblique aerial view centred on the remains of Kilphedir Broch, field system and hut circles, looking to the SSE. 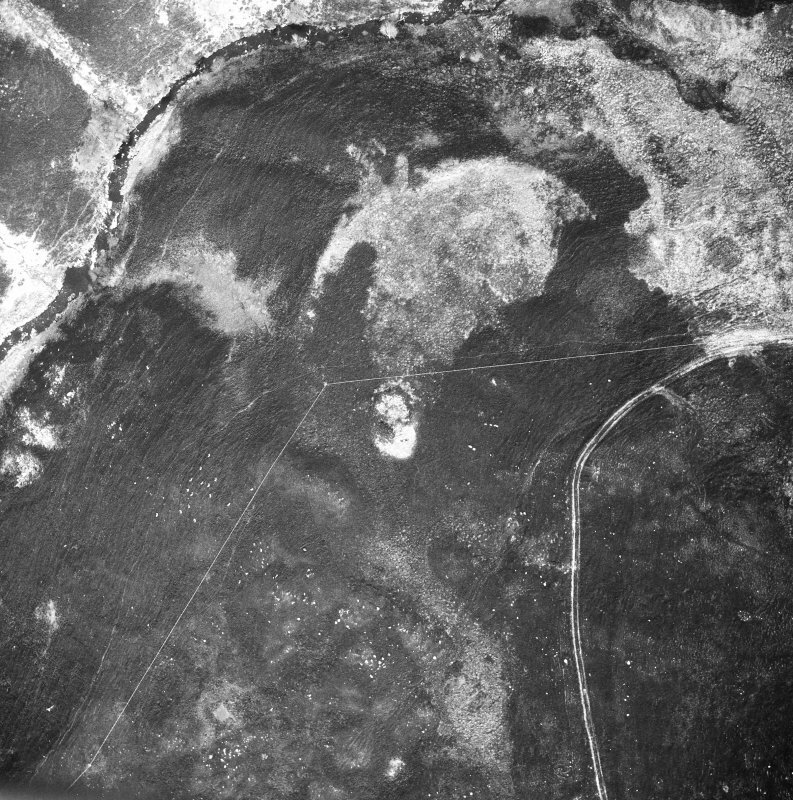 Oblique aerial view centred on Kilphedir Broch with the small cairns and hut-circles adjacent, taken from the ENE. 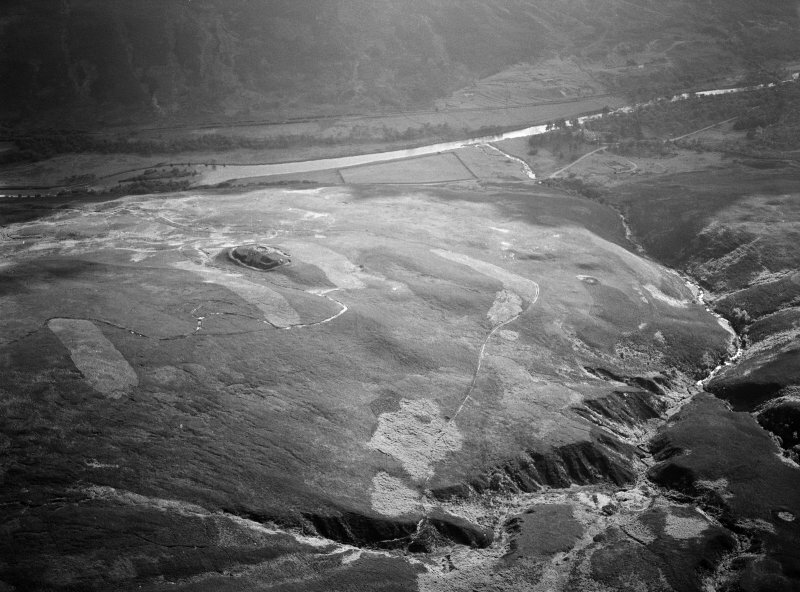 Oblique aerial view centred on Kilphedir Broch with the small cairns and hut-circles adjacent, taken from the S.
Oblique aerial view centred on the remains of Kilphedir Broch, field system and hut circles, looking to the ESE. 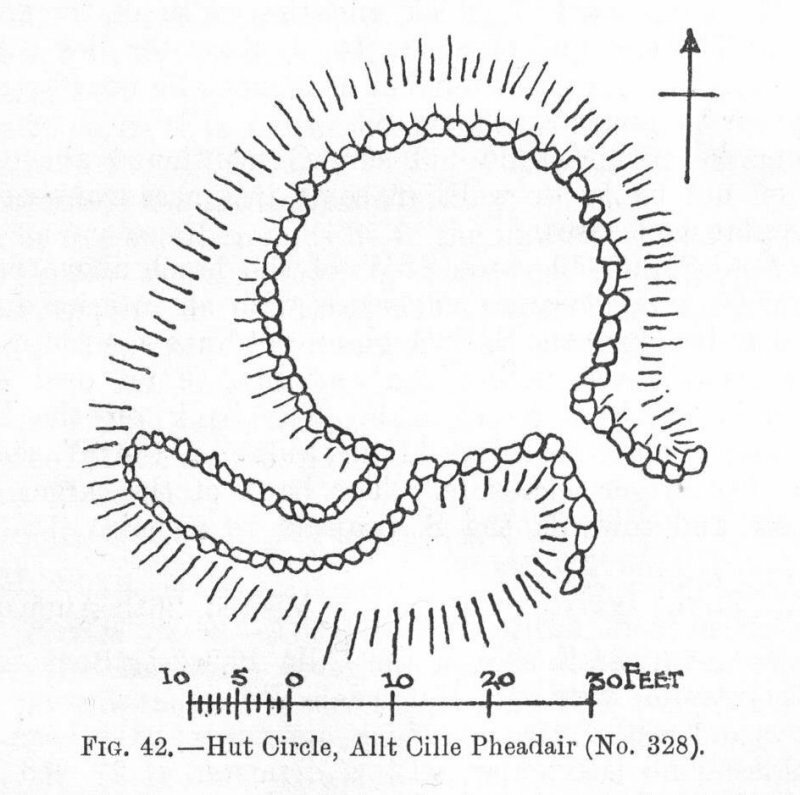 Publication drawing; plan of 'Hut Circle, Allt Cille Pheadair'. 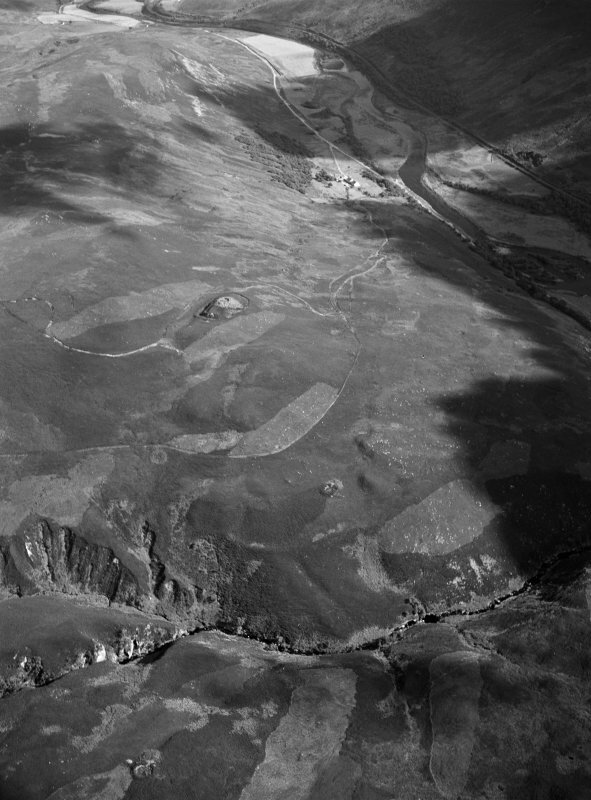 Oblique aerial view centred on Kilphedir Broch with the small cairns and hut-circles adjacent, taken from the ESE. 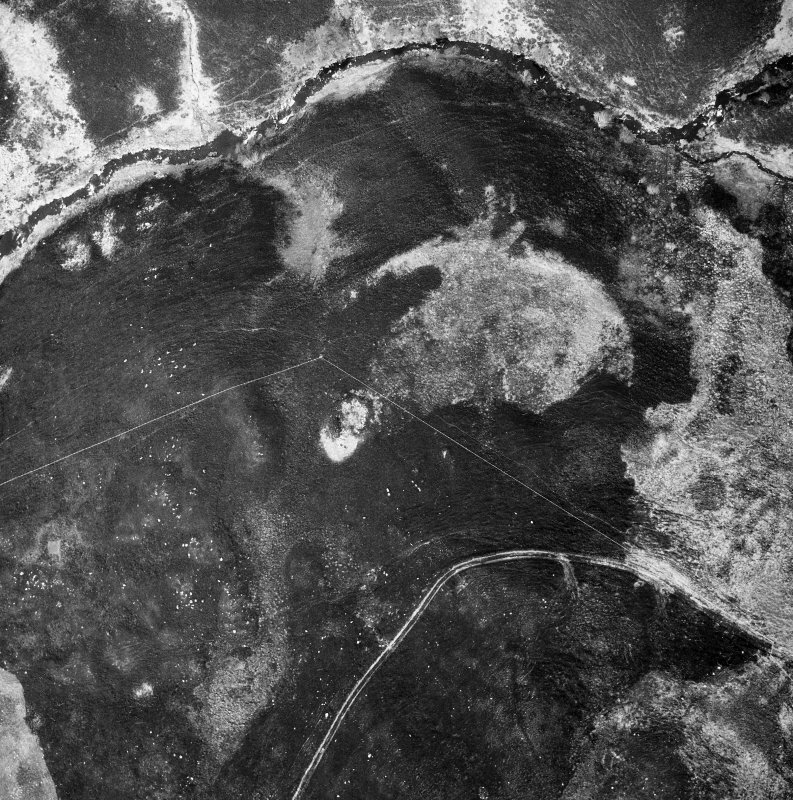 Oblique aerial view centred on the remains of Kilphedir Broch, field system and hut circles, looking to the SE. 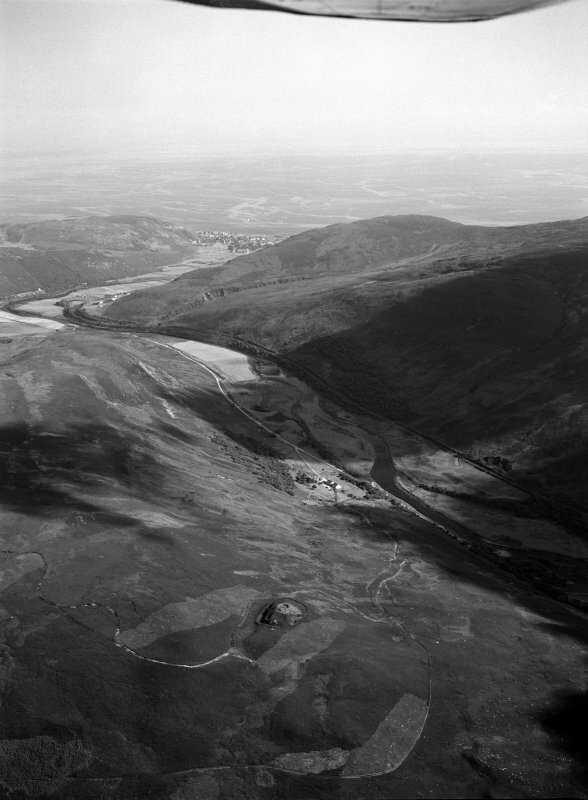 Oblique aerial view of the hut-circles and field systems and the Allt Cille Pheadair, looking to the N.
(NC 9913 1903) Earth House (NR). There are two hut circles (A and B) of which one (A) incorporates an earth-house. J M Joass 1873; RCAHMS 1911. Three enclosures (A-C) can be identified. Visited by OS (W D J) 20 May 1960. 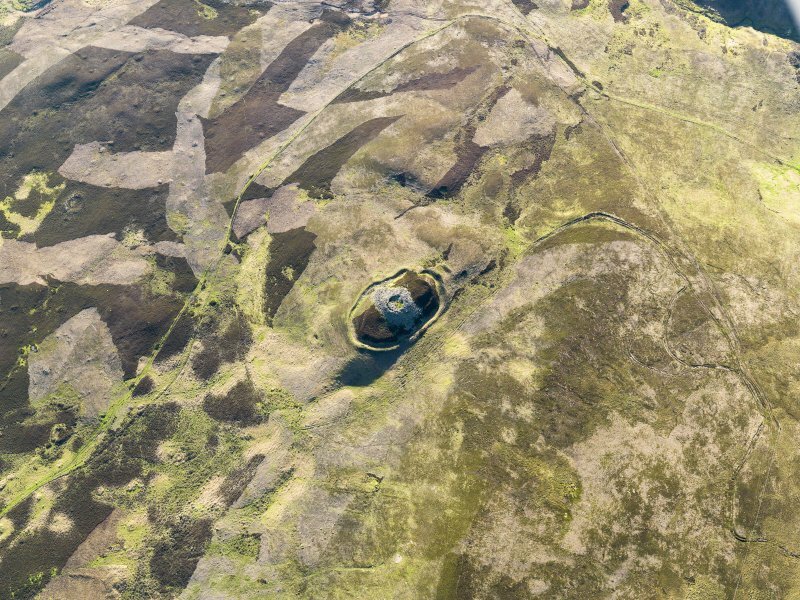 On a gentle W-facing moorland slope, above the gorge of Allt Cille Pheadair on the E side, is a settlement of three hut circles (A-C). Hut A, the best-preserved, measures 10.0m diameter within a massive wall, 1.5m maximum height, which is spread to 3.0m broad, widening to 5.0m at the entrance in the SSE arc. This entrance is club-shaped and choked with debris. Occasional slabs on edge indicate the remains of the inner wall face. 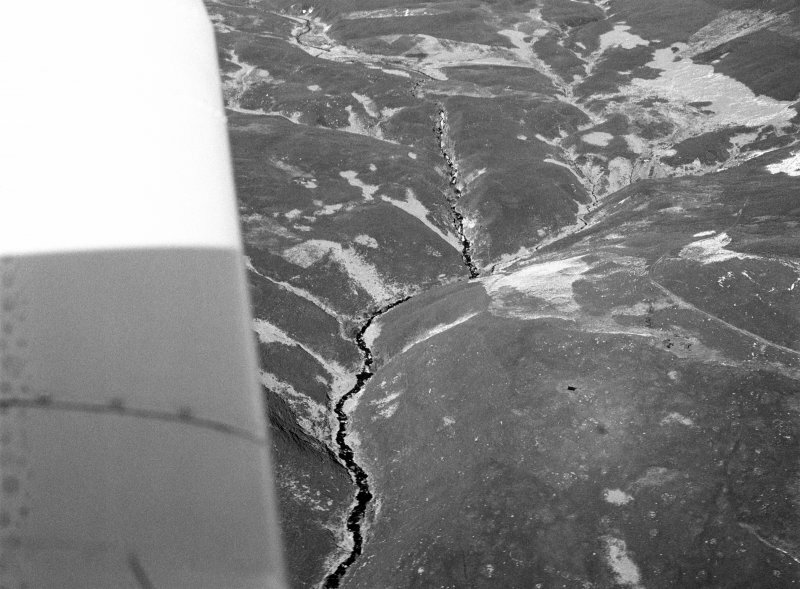 The souterrain as described by RCAHMS is virtually complete and accessible along its whole length of 10.0m. It is of dry-stone construction roofed with flags. It measures 0.7m wide and 0.9m high at the entrance on the SW side of the hut, increasing to a maximum of 1.3 wide and 1.4m high. Towards the end of the passage, an opening has been cleared in the roof. The other huts are less substantial and peat-overgrown. B, set into the slope is 12.0m in diameter within a mutilated wall spread to 2.0m broad. A slight dip in the wall in the SW arc probably indicates the entrance. C measures 10.5m N-S by 8.5m within a wall spread to 3.0m broad. It is set into a W-facing slope. The entrance was presumably in the S but no details survive. There is no trace of cultivation plots, and apart from a rickle of stones nearby, no clearance. However the surrounding ground is smooth and relatively stone-free suggesting some form of cultivation. Visited by OS (N K B) 19 July 1976. Information fron Historic Scotland, scheduling document dated 8 November 2000. The broch is on the hill east of the burn but cannot be seen from the road by the bridge. A sheep track just east of the bridge leads up the hill, bearing slightly right, and passes through a deserted crofting settlement under the line of the electricity poles; there are the foundations of a longhouse, and some smaller buildings and a kiln barn. From the first skyline the broch is visible on the hillside above, some 15 or 20 minutes walk from the road. The broch is set on a prominent knoll with good views up and down the valley. 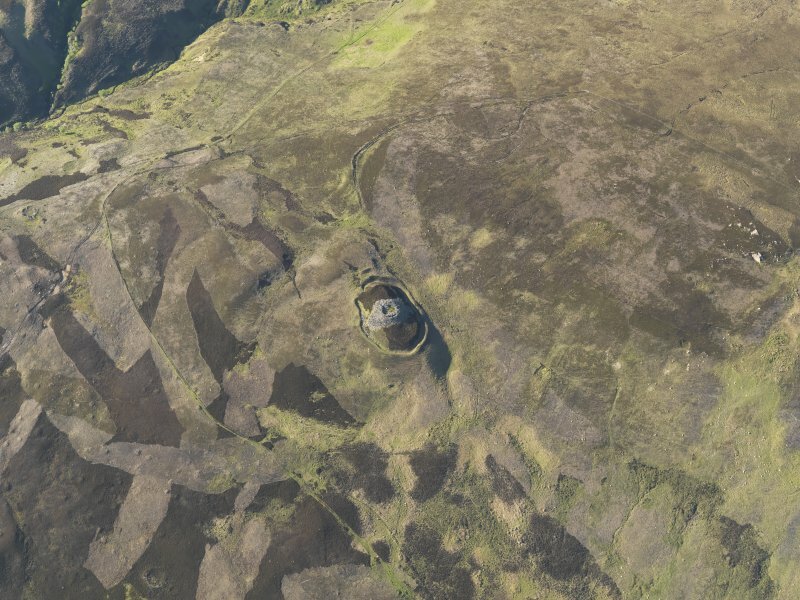 It is ruinous, and appears as a great mass of rubble spilling down the hill, but it has a particularly impressive set of outer defences, now all covered with heather so that the stone walls look like banks. There are terraces east and west of the broch defended by an inner rampart, a deep ditch and a stout outer rampart. At the west end, the entrance is protected by an extra short stretch of rampart. Just below the broch is a good path along the side of the hill; follow it west to find three hut circles on the edge of the ravine above the burn (NC 991190). One hut circle has much thicker walls than the other two, and this one has a souterrain leading out of it beneath its wall. The far end has been broken into, so light comes in, but it may be full of water and gumboots are needed. A muddy hole, originally provided with steps, drops down into the narrow souterrain passage; the latter has drystone walls and a lintelled roof and is about 9.50m long. There are more hut circles up the burn and on the west bank. Some of the latter were excavated in the 1960s, and shown to have interior posts that supported their thatched roofs, whi le radiocarbon dates from two huts suggest they were occupied in the last few centuries BC. A number of clearance cairns round these and other hut circles are probably of the same date and show that some patches of ground were cultivated. 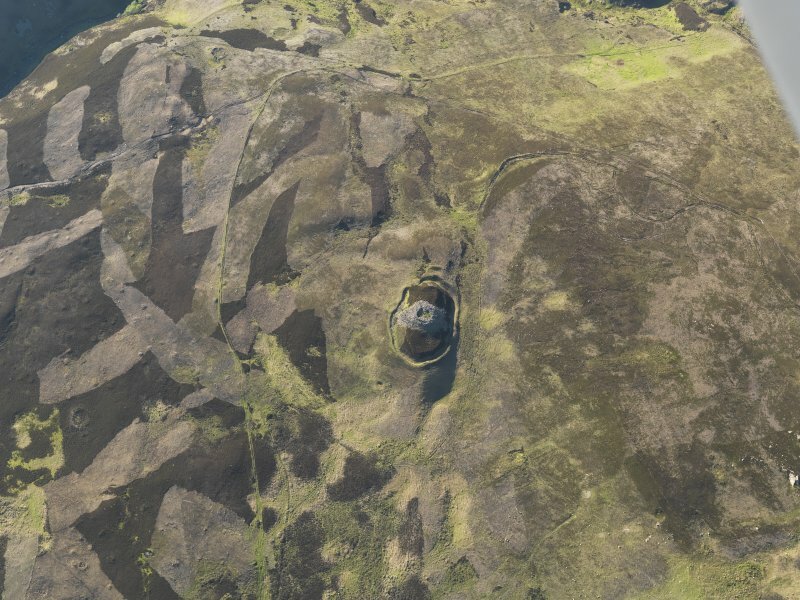 Many other hut circles can be seen on the hill slopes along the north side of the Strath of Kildonan, some indicated onthe OS map, and at least six other souterrains have been found, three still attached to hut circles. Part of one at Suisgill (NC 897250) is close to the east side of the road; only the far end survives, with lintelled roof and a curved end-wall, in which is a small built-in recess or cupboard .